Property taxes in America are collected by local governments and are usually based on the value of a property. The money collected is generally meant to support community safety, schools and infrastructure. Use these tools to better understand the average cost of property taxes in your area. The map indicates the relative cost of property taxes across the U.S. The darker the area, the lower the taxes. 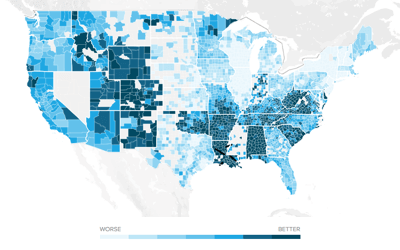 States with no color lacked the data needed for the graphic. When you purchase a home, you'll need to factor in property taxes as an ongoing cost. After all, you can rely on receiving a tax bill for as long as you own property. It’s an expense that doesn’t go away over time and generally increases over the years as your home appreciates in value. And what you pay isn’t regulated by the federal government. It’s based on state and county tax levies. Therefore, your property tax liability depends on where you live and the value of your property. In some areas of the country, your annual property tax bill is less than one month’s mortgage payment. In others, it can be as high as three to four times your monthly mortgage cost. With property taxes so variable and location-dependent, you’ll want to take them into account when you’re deciding on where to live. Many areas with high property taxes have great amenities, such as good schools and public programs, but you’ll need to have room in your budget for the taxes if you want to live there. Simply put, property taxes are taxes levied on real estate by governments, typically on the state and local level. Property taxes are one of the oldest forms of taxation. In fact, the earliest known record of property tax dates back to the 6th century B.C. In the U.S., property taxes even predate income taxes. While some states don't levy income tax, all states as well as Washington, D.C. have property taxes. For state and local governments, property taxes are necessary to function. They account for most of the revenue needed to fund infrastructure, public safety and public schools, not to mention the county government itself. You may have noticed already that the best public schools are typically in municipalities with high home values and high property taxes. While some states provide state funds to county projects, other states leave counties to levy and use taxes fully at their discretion. For the latter group, this means funding all county services through property taxes. To get an idea of where your property tax money might go, take a look at the breakdown of Avondale, Arizona property taxes. You can see that the Maricopa County takes a cut, as do local school districts and colleges, the library and the fire department. While this shows a specific example, you may not find the same breakdown of tax levies where you live. Your property tax bill often depends on county budgets, school district budget votes and other variable factors that are distinct to where you own property. Let's define a couple of key terms before we get into the details of how property taxes work. First, you must become familiar with the "assessment ratio." The assessment ratio is the ratio of the home value as determined by an official appraisal (usually completed by a county assessor) and the value as determined by the market. If the assessed value is $200,000 and the market value of your home is $250,000, the assessment ratio is 80% (200,000/250,000). The market value of your home multiplied by the assessment ratio in your area equals the assessed value of your property for tax purposes. Wondering how the county assessor appraises your property? Again, this will depend on your county’s practices, but it’s common for appraisals to occur once a year, once every five years or somewhere in between. The process can get complicated. In some states, your assessed valued is the current market rate of your home. The assessor determines this by comparing recent sales of homes similar to yours. In other states, your assessed value is thousands less than the market value. Almost every county government explains how property taxes work within its boundaries, and you can find more information either in person or via your local government’s website. Next, let's talk about another common property tax term: "millage rates." The millage rate is the amount per $1,000 of property value that's levied in taxes. Millage rates are expressed in tenths of a penny. One mill is $0.001. For example, on a $300,000 home, a millage rate of $0.003 will equal $900 in taxes owed ($0.003 x $300,000 assessed value = $900). To put it all together, take your assessed value and subtract any exemptions (more on exemptions below) for which you're eligible and you get the taxable value of your property. That taxable value gets multiplied by the sum of all applicable millage rates. As you can see in the Avondale, Arizona example above, each school district has its own millage rate. All the separate tax levies are added and then applied to your taxable value. The number you calculate (millage times taxable value) tells you the property taxes owed before any credits. Note that tax credits are different from exemptions and aren’t universally available. You’ll have to check with your county to see if you’re eligible for any. These credits are subtracted from taxes owed. Once you find that number, you have your total property tax bill. How you pay your property tax bill varies from place to place. Some people pay extra each month to their mortgage lender. The lender keeps that money in escrow and then pays the government on behalf of the homeowner. 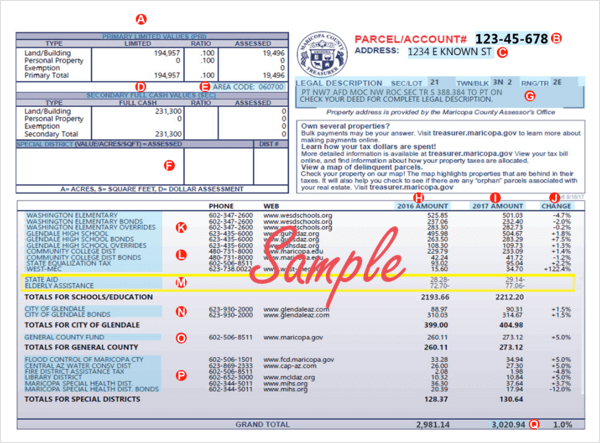 Other people pay their property tax bill directly to the county government monthly, quarterly, semi-annually or annually. Your payment schedule will depend on how your county collects taxes. Most states and counties include certain property tax exemptions beyond the full exemptions granted to religious or nonprofit groups. These specialized exemptions are usually a reduction of up to 50% of taxable value. However, it can vary. Some states offer exemptions structured as an automatic reduction without any participation by the homeowner if your property is your primary residence. Other states and counties require applications and proof for specific exemptions such as a homeowner who’s a disabled veteran. Let’s look at an example to illustrate with regard to the homestead exemption, which safeguards the surviving spouse and protects the value of a home from property taxes and creditors in the event a homeowner dies. 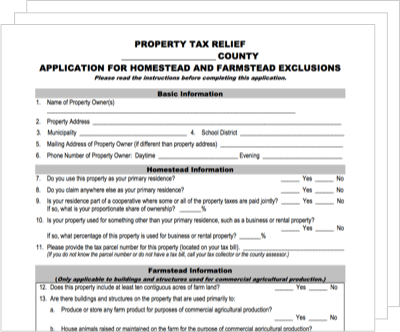 Say your state offers a homestead exemption for a homeowner’s primary residence that offers a 50% reduction of the taxable value. This means if your home was assessed for $150,000, and you qualified for an exemption of 50%, your taxable home value is $75,000. The millage rates would apply to that reduced number, rather than the full assessed value. It’s worth spending some time researching whether you qualify for any applicable exemptions in your area. If you do, you can save thousands over the years. Overall, homeowners pay the most property taxes in New Jersey, which has some of the highest effective tax rates in the country. The state’s average effective rate is 2.19% of home value compared to the national average, 1.19%. The least expensive state for property taxes is Hawaii, surprisingly. Despite its reputation as a costly place to live, Hawaii has generous homeowners exemptions for primary residents that lower taxable values considerably. The tax break generally helps those who live on Hawaii full-time, rather than those who own second homes there. Also of note are Colorado and Oregon’s property tax laws, which voters put in place to limit large taxable value increases. Many states don’t have caps on how property taxes can change year to year, but those two are examples of state governments that put laws in place because of taxpayer concern. When you're deciding whether buy and where, property taxes need to play a role in your deliberations. The amount they vary across county lines and school districts can be substantial. Unlike mortgage payments, property taxes never go away. You may be able to get a property tax break when you're a senior, but you should plan on having property taxes as a permanent part of your budget before you take the leap into homeownership.